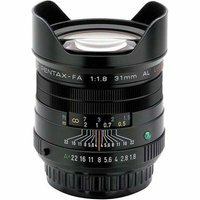 The unique PENTAX smc FA 31mm f/1.8 Limited lens offers exceptionally high image and a wide-angle perspective. It incorporates a glass-moulded aspherical lens element into its 9-element, 7-group optics, and offers sharp, crisp image reproduction, even at the maximum aperture of f/1.8. It features a beautiful aluminium body and comes equipped with a flower-shaped lens hood.